Sources: Sources for data in tables: Equity Market and Fixed Income returns are from JP Morgan as of 03/15/19. 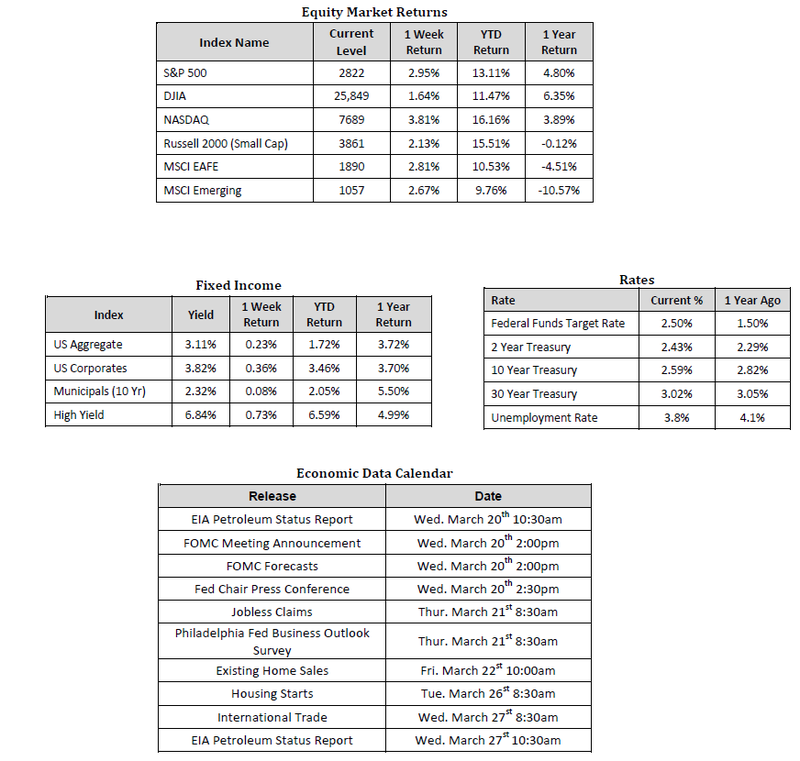 Rates and Economic Calendar Data from Bloomberg as of 03/19/19. International developed markets measured by the MSCI EAFE Index, emerging markets measured by the MSCI EM Index. Sector performance is measured using GICS methodology. Global equity markets had one of the strongest weeks in the past 12 months as investors celebrated strong earnings, progress in U.S/China trade negotiations, and a delayed Brexit. In the U.S., the S&P 500 Index propelled substantially higher finishing the week at a level of 2,822, representing a gain of 2.95%, while the Russell Midcap Index followed suit gaining 2.40% for the week. On the international equities front, developed markets returned 2.81%, while emerging markets advanced 2.67%. Finally, the 10-year U.S. Treasury yield continued its gradual descent lower and finished the week at 2.59%. In past issues we’ve discussed the likely re-emergence of volatility throughout 2019 at length. Increased periods of short term volatility is seemingly back and is here to stay for the foreseeable future. Naturally, as stock investors, we’re pleased to experience weeks like the last. However, we also recognize that the S&P 500 Index lifting 2.95% higher on the week is, in part, a byproduct of volatility. In other words, an investment that moves 2.95% higher in a week can just as easily depreciate 2.95% over the course of a week. In our opinion, strategies that pursue a broad-based, diversified approach designed to mitigate concentrated exposure to any single company are more likely to weather the volatility storm. Take for instance, the historical volatility of the individual stocks that have comprised the S&P 500 Index since 1990, compared to the volatility of the S&P 500 Index over the same time period. The average total return of the individual stocks over the time period reviewed was 9% per year with a standard deviation of 45%. Statistically, this means that any of the individual stocks analyzed could have gained 55% or lost 36% in a given year, but ultimately averaged 9% a year. In contrast, the S&P 500 Index averaged an 11% return per year, along with a standard deviation of 28%. The main take-away being that the lower risk, lower volatility, strategy ultimately produced better results. Less variability, led to more consistent returns, which lead to better long-term performance. Following nearly a decade of impressive U.S. stock market growth, many investors have developed heavy concentrations in individual companies, possibly without even realizing it. This imbalance, if left unchecked, could lead to elevated volatility and lackluster returns, which is why we encourage investors to revisit the diversification that may, or may not, be in place within their existing portfolios. If you would like to learn more about how we are helping clients invest dynamically and consistently with their own goals, time-frame and tolerance for risk, please do not hesitate to speak with your Hennion & Walsh Financial Adviser.